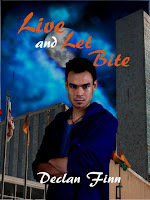 I want to thank everyone who aided and abetted my launch of Live and Let Bite today, as well as the launch party last night. Some of these people played around with the launch party on Facebook. Some shared links. Some boosted the signal on their blog, or their social media. To Gregory Stern (yes, I've noticed the tweets. Thanks). Yes, there are a lot of people here. In part because I've put a lot of effort into promoting the book, and asking for help, and because I have a lot of really awesome people in my general social circle. And now ... they're still available for under $7. Enjoy. You're very welcome, Declan. Congratulations on the launch!